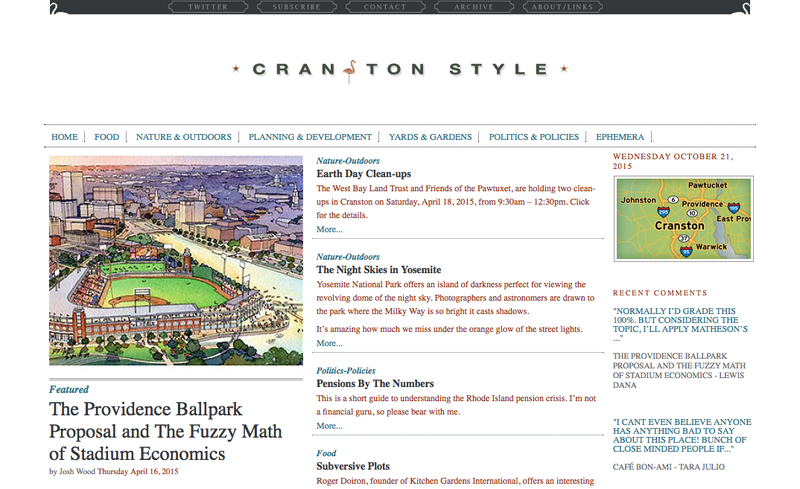 Cranston Style was launched on February 27, 2008 during the first wave of the so-called local blogs. 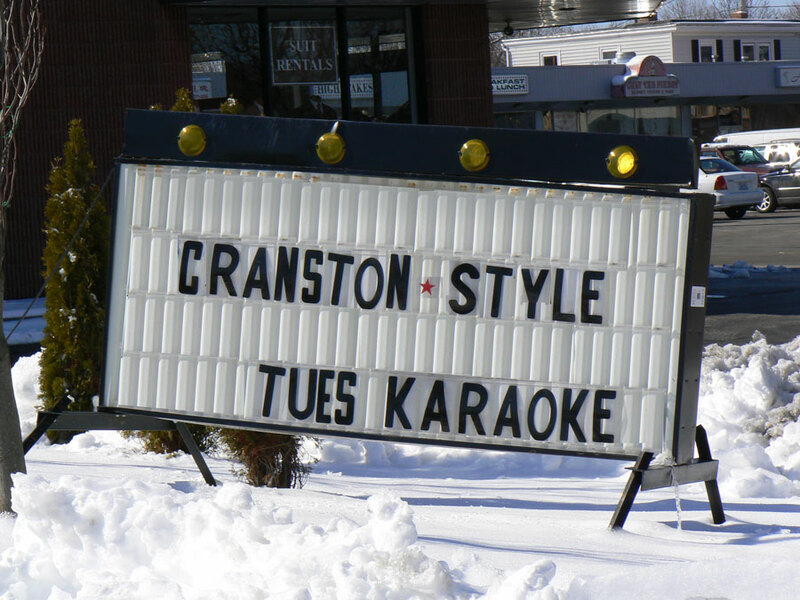 Initially Cranston Style hosted events, reviews, light political fare, and plenty of bad writing. It underwent two comprehensive style changes in the first 3 years. When AOL expanded their Patch project, Cranston Patch was doing a lot of what Cranston Style was doing and doing it better. Cranston Style has been reborn as a pared-down, fragmented treatise of sorts, focused on the future of Cranston, Rhode Island. To generate a portfolio of public spaces missing from Cranston’s vernacular. To support the expansion of public transportation in the Providence metro area to relieve traffic and ease the pressure on the environment. To focus on the conservation of open space, and the expansion of parks, bike trails and paths to enjoy outdoor activities and the natural world around us - and to protect and draw attention to Cranston’s natural resources. To explore ways to reduce our impact on the environment, such as supporting local farms and farmers’ markets, recycling, reducing lawns, encouraging smart planning, and composting. To promote smart development practices in order to reduce sprawl, conserve resources, encourage concentrated neighborhoods that promote pedestrian activity, create a sense of place, and generally increase the quality of life in Cranston. Hello. My name is Josh Wood. I’m a designer, and I’m on a mission. In 2002, I moved to Eden Park, a small neighborhood in the city of Cranston, Rhode Island. In 2006, Cranston made the top 50 in the book “The Absolutely Worst Places to Live in America,” sharing the dubious honor with Seattle and Washington DC. Cranston is funky, strange, eclectic, poorly planned, and at times, ugly, yes. But is it really one of the absolute worst places to live in America? Cranston is probably best known as the universal nexus of Big Hair. An honor established in the 80’s with the renaissance of mall culture and the pinnacle of glam metal. Cranston is also epicenter of the Rhode Island accent, where r’s are arbitrarily lost and found and where the nasally twang is best heard through snapped gum. It’s a place of exuberant masonry and cement lions, where the dogs are white and small like cats, and the shrubberies are shaped like gumdrops. The city of Cranston’s web site slogan is “Cranston - We’re on the Move!” Given the reputation of the city, an outsider might read this literally - as if all 79,269 of the city’s residents have packed up their things and decided to seek greener pastures over the border in Providence. I’m on a mission to change that. I want to capture the sights, the sounds, the smells of the true Cranston. I want to document just how big Cranston hair actually is. I want familiarize myself, and the reader, with the exquisite music of the Cranston accent. I want to discover the superb hidden restaurants, tucked away in the vast, treeless shopping plazas that stretch as far as the eye can see. I want to know if cement lions really are the official city animal. I’m out to discover if there is a Cranston Style.